If you’re one of more than 20 million Americans with diabetes, you know how important it is to eat the right foods. People with diabetes have high levels of sugar in their blood. This is because their body cannot move sugar into fat, liver, and muscle cells to be stored for energy—this could be caused from their pancreas not making enough insulin, their cells not responding normally to insulin or both. And one of the treatments for diabetes includes diet. Managing and maintaining blood sugar levels can be a challenge, but focusing on the foods you can eat can make diabetes management less frustrating. Foods for diabetes that are chock-full of healthy nutrients like calcium, fiber, omega-3s and vitamin D can be used in many recipes and they’re versatile: barley, beans, berries, dairy, dates, flaxseed, greens, lentils, salmon, tuna, walnuts and more. 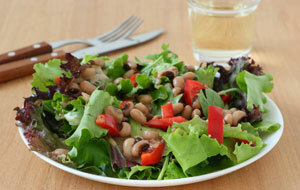 Add beans to chili, salads and soups. Enjoy calcium-rich cottage cheese as a snack or dessert. Instead of chicken or meat, sauté a salmon filet for dinner. Add fresh antioxidant-rich berries to oatmeal and salads. And include greens into your main meals and sandwiches, or sauté some collard greens in olive oil. With some planning and inspiration, you can enjoy many delicious dishes that will help you manage diabetes.